Samsung VL350 vs JBL Charge 4 vs Yamaha MusicCast 50 wireless speakers: which are Best Buys? The start of the festive season brings with it some of the biggest wireless and Bluetooth speaker launches of the year. From the Google Home Hub with its seven-inch touchscreen to Samsung’s first major multi-room speaker launch in years, find out which perform best below. Alongside the new premium Samsung VL350 speaker, we’ve tested one of its biggest rivals: the high-powered Yamaha MusicCast 50 speaker. It’s suitable for connecting to your TV for home theatre use and even for connecting to turntables that have a built-in phono stage (ie pre-amp). If you’re looking at starting a multi-room audio setup, it’s important you choose a brand that has more than one great-sounding speaker as well – see the chart below to find out how brands compare. For portable speaker fans we’ve also tested the highly anticipated JBL Charge 4, and there’s been lots of talk comparing it with its predecessor the JBL Charge 3. Head to our review below for the definitive verdict from our music professionals on which sounds best. Best Buy wireless and Bluetooth speakers – see our full list of the best speakers on the market. Samsung has partnered with AKG to bring more than 70 years’ audio specialist experience to the table in designing its major new wireless speaker, which is available in black (VL350) or white (VL351). This Bluetooth and wireless multi-room speaker is designed to be the ideal fit for your home, with a slim minimalist design great for wall mounting or placing on a countertop. It also features a hockey-puck-shaped remote control so you can easily control the speaker from a distance – it’s magnetic too, so you could attach it to your fridge, for instance. 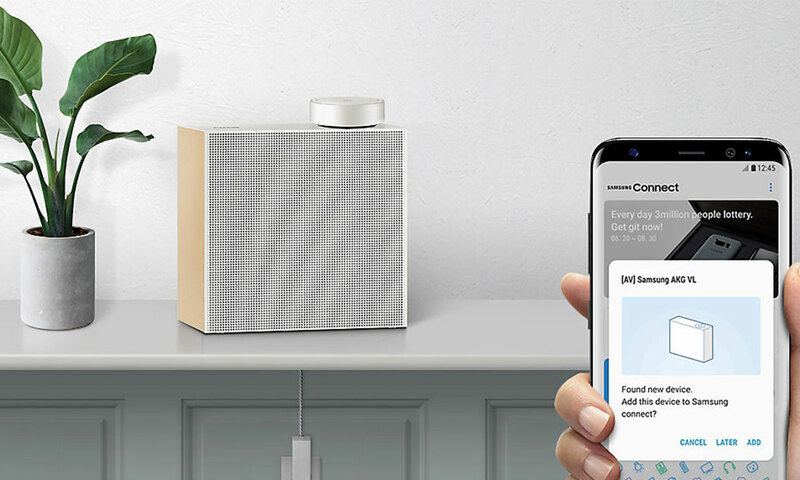 It also features full integration with Samsung’s SmartThings ecosystem for interacting with Samsung’s other smart household tech. But is its thin design really capable of competing with more traditional, boxy speakers? Find out whether the sound quality is up to scratch in our expert Samsung VL350 review. JBL speaker fans have long awaited the update to the popular JBL Charge 3, and which is better has provoked heated debate. This is a simple portable Bluetooth speaker that’s available in a wide range of colours, and is also remarkably fully waterproof – it can even survive being completely submerged in water for a limited time. It’s large enough to inspire confidence that it could fill a room with full-bodied sound, plus it has the potential for good battery life. You can even usefully charge your smartphone from the speaker – which could be a lifesaver at a music festival or on a camping trip. So it’s verdict time. Has the JBL Charge 4’s sound improved on its predecessor? 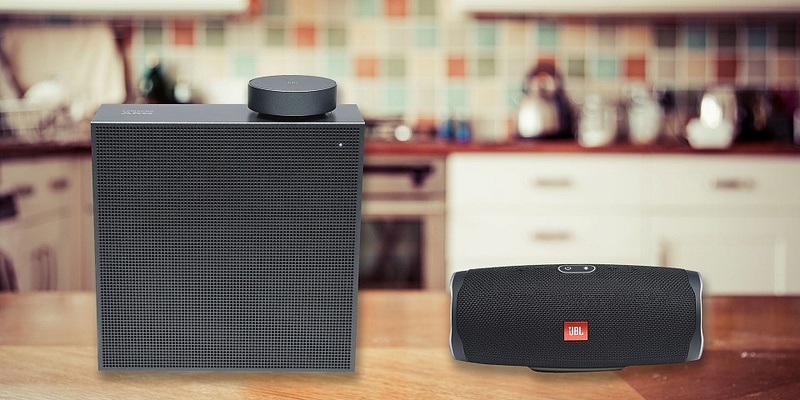 We reveal all in our definitive JBL Charge 4 review. 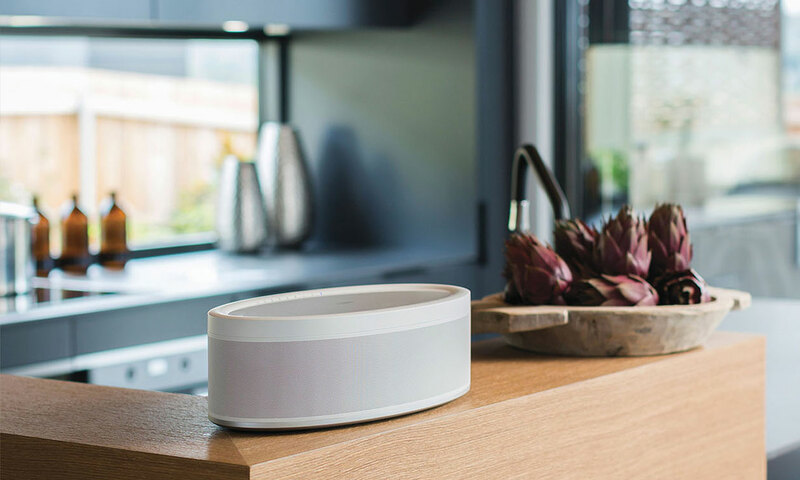 Those with lots of audiovisual tech at home can struggle to integrate them with many wireless speakers, which keep cutting back on traditional wired connections. Yamaha has formed a bulwark of resistance to this trend, and the result is an incredibly versatile speaker. The high-powered Yamaha MusicCast 50 not only has a 3.5mm socket but also an optical output to connect to your TV and even RCA connections to connect to analogue equipment such as turntables (those with a built-in phono stage or preamp, such as the Yamaha MusicCast Vinyl 500 (TT-N503)). And it’s packed with the latest features as well, including AirPlay to work seamlessly with Apple devices and music streaming services support including Spotify, Deezer and Tidal (may require subscriptions, particularly if not played via Bluetooth from your smartphone). And while the speaker doesn’t natively support voice control, you can control it with your voice via an Alexa device such as an Amazon Echo Dot. Is this the ideal powerful speaker for you? Find out whether the sound quality is worth your money in our comprehensive Yahama MusicCast 50 (WX-051) review. We’ve also reviewed its smaller sibling – see our Yamaha MusicCast 20 (WX-021) review. Smart displays are a relatively new concept – combining a smart speaker with a screen – and you may think they couldn’t possibly compete with a more traditionally designed wireless speaker for sound quality. However, we’ve already previously tested a smart display which impressed our expert listening panel so much with its Best Buy sound that members of the panel bought one for themselves after the test. 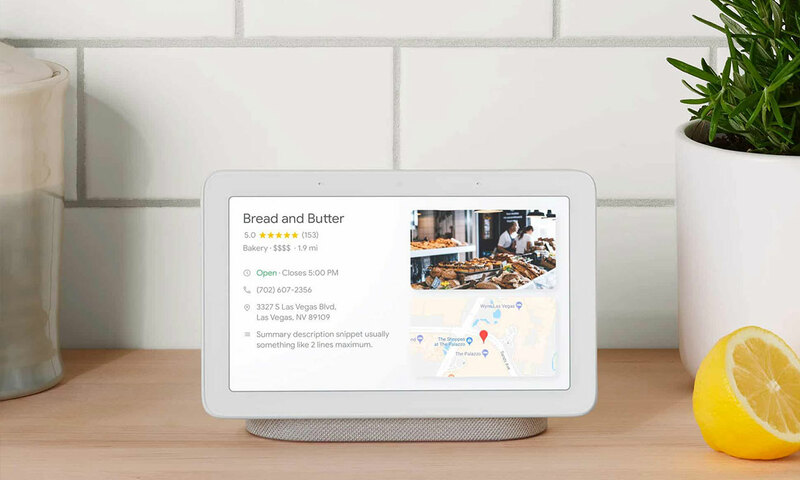 Find out whether the Google Home Hub can reach this standard as well. The Home Hub is Google’s answer to the rival Amazon Echo Show (2nd Gen), but comes in at a much more affordable price. Google claims it’s the ideal all-in-one smart hub for your home, perfect for the kitchen. It combines a wireless speaker, for playing music, with lots of on-screen functionality, and you can even control compatible smart devices such as smart lights and smart thermostats using only your voice. So can the Google Home Hub beat the best smart display we’ve tested for sound? We’ve also found Don’t Buy smart displays, so take care. See how the Google Home Hub performs for sound quality in our extensive Google Home Hub review. Which wireless and Bluetooth speaker brands have the most Best Buys? If you’re considering getting a powerful multi-room speaker, it’s important to choose well. Not only can they cost several hundred pounds, if you plan to add to your home audio setup with multiple speakers over time, it’s important to go for a brand you can trust to produce lots of great-sounding speakers. So, which brands have the most Best Buys? 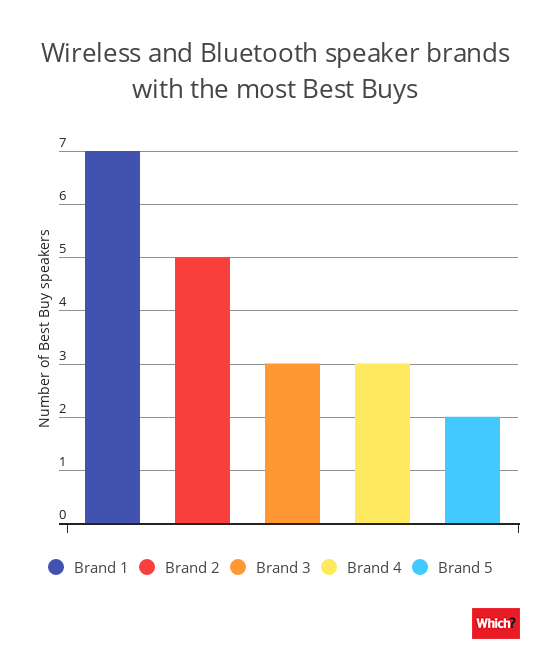 The chart below shows that a very small number of speaker brands dominate our list of the best-sounding speakers on the market, with the top five brands commanding more than half of our Best Buys, out of the more than 180 wireless and Bluetooth speakers we’ve reviewed currently available on the market. In fact, only these five brands have more than one speaker that we’ve awarded a Best Buy – so it can be essential to choose one of these brands if you’re looking to set up a multi-room setup; many speakers only connect to same-brand speakers. You can avoid this restriction, however, by finding speakers with cross-brand compatibility, such as those with Chromecast built-in. See how the best wireless and Bluetooth speaker brands compare below. To find out which brands we’ve found produce the best-sounding speakers on the market, head to our Best Buy speakers page.